In Genesis 16, Sarai, afraid that God will not give her a child, pleads with Abram for a surrogate to give her a child. She chooses Hagar, her Egyptian servant, to bear a child for her. When Hagar conceives, Sarai perceives her as a threat so she mistreats her. Hagar runs away and finds herself alone in the desert. She is sitting near a spring when the angel of the Lord appears to her and gives her a promise. Hagar returns to Sarai and Abram’s first son, Ishmael, is born. This story shows how Hagar was “just a servant” (and, more likely, a slave). Sarai and Abram treat her as an object, using her for her fertile womb. It is only the angel of the Lord who calls her by name: “Hagar.” Not only does Hagar experience God’s care, but she is the first recorded person to be visited by the angel of the Lord. In turn, Hagar gives God the name, “El Roi,” meaning “the God who sees me.” This foreign female slave is the first person in the Bible to name God. He heard Hagar’s misery and he saw her. He knew her by name and he cared about her. God is with those who are casualties of others’ mistreatment and misuse—the outcast and the marginalized. He hears and sees their misery. Jesus describes God as the Shepherd who leaves his 99 sheep to find the lost one. Hagar’s story demonstrates the power of being heard and being seen. Her experience is a sign of God’s love and care for those who are marginalized, who are experiencing persecution and powerlessness. God sees our misery, hears our cries, and is willing to make himself visible to us. 1. Whom do you identify with more in this story, Sarai or Hagar? 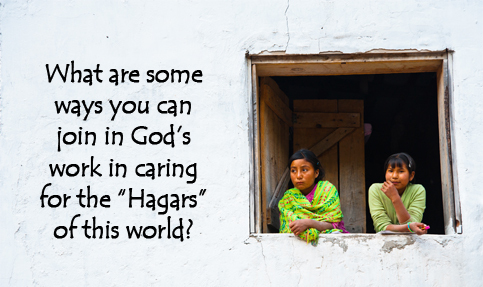 If you identify with Hagar, how might God want to care for you? If you identify with Sarai, what are some ways you can join in God’s work in caring for the “Hagars” of this world? 2. Do you believe that God sees you? If so, what are the implications for how you see others? Mardi Dolfo-Smith is Discipleship Pastor at North Shore Alliance Church in North Vancouver, BC. Mardi has been a pastor in the C&MA for 12 years.